“You may have heard that the battle royale genre is quite popular these days,” I say with a dry irony that suggests both you and I know this is a significant understatement. PlayerUnknown’s Battlegrounds wasn’t the first, but it is the biggest, and games like Fortnite and now Paladins are following in PUBG’s footsteps and there are likely many more to follow. We have our own PUBG tips and tricks guide. But the nature of battle royale means that you can spend a lot of time playing without much chance to hone your skills. You might spend 30 minutes looting only to get gunned down without a chance to return fire. A new Steam game aims to let you hone your skills without the threat of other players or the time investment of a full match. 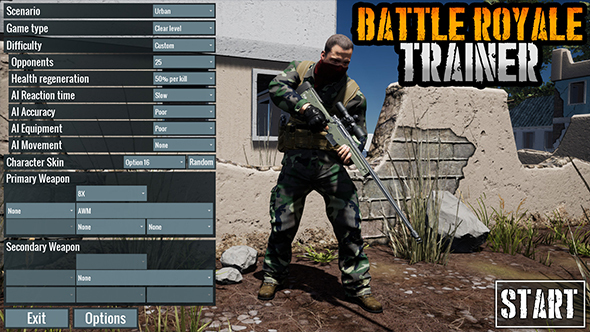 Battle Royale Trainer lets you practice against AI opponents and targets, “honing your skills until you can snap-shoot, control recoil and head-shot your opponents at any distance like a pro.” Weapons include assault and sniper rifles, SMGs, and shotguns, you can switch between first and third person, and there are urban, woodland, and firing range maps. The developers promise “fully modelled bullet physics with accurate bullet-drop,” which is really the main thing you’d want out of a game like this. It’s not a terrible idea (in theory), but the early Steam reviews do point out one significant problem: the recoil pattern is entirely different from PUBG’s. If the ballistics don’t behave exactly as they do in the game they’re emulating, then the whole exercise seems rather pointless. That’s assuming you’re not already put off by the idea of an entire game existing to compensate for a feature missing from a popular title. But, in effect, it’s not entirely different from an unauthorized game guide. This is the only title from developer Trickjump Games, and it’s available for the bargain-ish price of $3.99 / £2.89 / €3.99.